Some of the U.S.’ most senior lawmakers are urging Barack Obama to speak out on what they called Cambodia’s deteriorating human rights situation when the U.S. president makes what will be the first visit to the country by a sitting American leader later this month. The newly re-elected U.S. president is among a coterie of world leaders set to attend the U.S.-Asean Leaders Meeting and East Asia Summit in Phnom Penh beginning November 18. In their October 31 letter to Mr. Obama, 12 U.S. lawmakers—including Senator and former presidential candidate John McCain—warn that keeping silent on Cambodia’s human rights record would play into China’s hands. 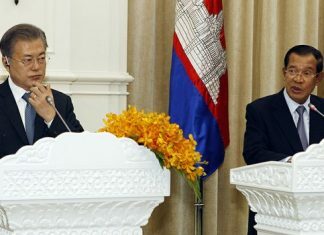 “By taking a strong and public stand in support of human rights and democracy during this first-time visit by a U.S. president to Cambodia, your words would encourage and embolden the Cambodian people and send a clear message to the entire region about American values and expectations, particularly in the wake of the Arab Spring,” they said. The letter comes amid mounting competition between China and the U.S. for the allegiance of Southeast Asian countries, recently divided by their support for—or opposition to—China’s claims to territory in the energy-rich South China Sea. It also comes amid a U.S. “pivot” to the Asia-Pacific, which will see new deployments of U.S. armed forces to the region. In their toughly worded letter, the U.S. lawmakers accuse Mr. Hun Sen’s government of a long list of abuses, from manipulating state institutions, controlling the courts and intimidating human rights activists. They also urged Mr. Obama to call for the pardon of convicted opposition leader Sam Rainsy—presently in self-imposed exile to avoid a lengthy prison sentence for what the U.S. lawmakers called politically motivated charges—and the fair treatment of other prominent human rights and political activists. “We urge you to call on the Cambodian government to take immediate steps to improve the political atmosphere ahead of scheduled 2013 elections, especially by pardoning opposition leader Sam Rainsy and allowing him to return to Cambodia, encouraging an election environment in which the CPP’s autocratic rule can be freely and fairly challenged, and by appointing a new and independent [National] Election Commission,” they said. Mr. Sonando, who owns one of the country’s few independent radio stations, was sentenced to a 20-year jail term last month on what rights groups have called trumped up charges of fomenting a secessionist movement. “Cambodia is becoming a more dangerous place for those who speak out about these problems,” the U.S. lawmakers added, noting the April murder of environmental activist Chut Wutty and the fatal shooting of 14-year-old Heng Chantha in May during a violent land eviction, both at the hands of security forces. “There is also a worsening problem with corrupt land expropriations,” they said, noting NGO reports claiming that some 400,000 Cambodians have been evicted from their land in the past 10 years. The U.S. Embassy has declined to divulge any details about Mr. Obama’s visit to Cambodia. But in a letter to the president congratulating him on his reelection, Mr. Hun Sen said the two leaders would hold a bi-lateral meeting on the sidelines of the East Asia Summit. Council of Ministers spokesman Phay Siphan thanked the U.S. lawmakers for their “concerns” and said Mr. Obama’s visit to Cambodia would offer the government a chance to explain the progress it has made addressing them. “Some issues [they raised] are out of date already and we are in transformation,” Mr. Siphan said, noting the land titles the government was constantly handing out to stave off ownership disputes. As for other issues, he said, “we cannot solve in 24 hours,” and denied that Mr. Rainsy and Mr. Sonando’s convictions were in any way politically motivated. Other senior U.S. lawmakers joining Senator McCain in the letter were Senator Joseph Lieberman, a former vice-presidential candidate, and Senator Patrick Leahy, a member of the powerful Appropriations Committee, which pulls the government’s purse strings. Phil Robertson, deputy Asia director for Human Rights Watch, said the seniority of the lawmakers expressing their concerns about the situation in Cambodia should carry extra weight with Mr. Obama and outweigh strategic concerns over China. “The very serious concerns expressed by senior lawmakers should make the Obama administration sit up and listen,” Mr. Robertson said. The letter to Mr. Obama follows resolutions raising nearly identical concerns passed by the Australian Senate and the European Parliament in recent weeks.